Come on in to Greenies! Try to beat our foursome… Beef, Pork, Chicken and Fish. 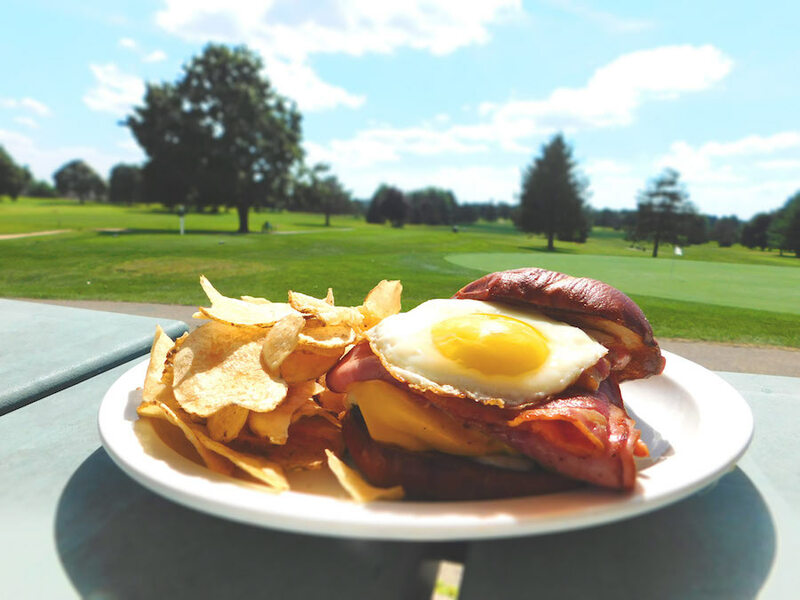 Breakfast, Lunch or Dinner with a beautiful view overlooking the golf course. Greenies is the place to go when in the Delavan area. We have great dishes for you to enjoy and we give you plenty. Our prices are very reasonable, friendly attentive service and a nice atmosphere with lots of windows. We have daily specials of the house as well as a wonderful Sunday brunch. Saturday’s we are grilling, enjoy ribeye steak, chicken, bbq ribs, pork chops, prime rib and shrimp to satisfy everyone’s appetite. Greenie’s Clubhouse has been serving great tasting, quality food to people in the Lake Geneva area since 2001. Prior to opening up Greenie’s at Delbrook Golf Course he was the head of food and beverage at Alpine Valley Resort in East Troy, WI. George honed his skills under the watchful eyes of Mentor David Schaefer from “Los Amigo’s Restaurant” in beautiful Fairbanks Alaska. He taught hard work, good food in a friendly place with good help is hard to beat. It’s also hard to achieve, but George has lived by that motto and works daily to keep Greenie’s the place the “locals go” for great food at a great price. So please come on in and try us out! You won’t be disappointed. George, My complements to the chef. The fresh walleye was excellent, huge portion enough to take some home and enjoy again. Keep up the good work! Thank you so much for catering our open house and making our event fantastic. George, the food was amazing! Thank you for sending Sherry and Vicky they where great and helped make the entire evening enjoyable for all of us knowing that the food and our guests were in such good hands. You all Rock!! Thank you!!! We cannot thank you enough for all you did the day of our wedding reception! We had such an amazing time and we are so glad we picked Delbrook for our event! Our friends and relatives are still talking about how great the food was. We cannot wait to find another excuse to have a party and without a doubt have you “host” it! Thank you so much for all you did to make our bridal shower such a success. Your staff was wonderful, extremely helpful, friendly and George the food was fantastic as always. Keep up the good work. We would like to thank all of you for helping to make our class reunion such a success! Everyone attending really enjoyed themselves and were thrilled with the menu, location and service. It would not have been so special without your help.